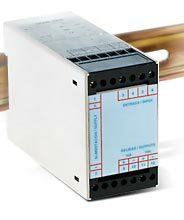 The CCT series DIN rail signal conditioners are designed to accept a broad range of input signals, such as ac and dc voltage and current, frequency, temperature (thermocouple and RTD), and process transducers, and provide standard process outputs of either 0/4 to 20 mA, or 0 to 10 Vdc. The CCT series features a modern housing design, that is easily mounted on standard DIN rails. Connections are safely and securely made, with input and output connections on the opposite sides of the module. The CCT series is designed using an internal plug-in three module system that provides flexibility in selecting and changing the power supply, input signal and output signal. The units are supplied with 110 Vac power standard, Consult sales for 220 Vac, and 24 Vdc power. The three internal modules in each signal conditioner (signal input, signal output and power supply) are isolated up to 2 kVeff. Each CCT series signal conditioner is available with current and voltage output (only one may be used at a time). Available output types include 4 to 20 mA or 0 to 20 mA (jumper-selectable) and 0 to 10 Vdc. Standard outputs are linear and proportional to the signal input. Thermocouple input modules feature special circuitry to linearize the output to the actual temperature, and not to the non-linear signal produced by thermocouple sensors. Nota: *The CCT-08 signal frequency range is 20 Hz to 6KHz. **110 Vac powered units supplied standard. To order 220 Vac or 24 Vdc powered models add “-220VAC” or “-24VDC” to the model number. No charge for 220 Vac, add $50 to price for 24 Vdc.